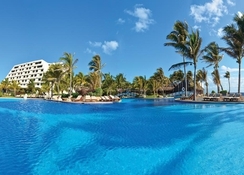 Grand Oasis Cancun is an all inclusive family-friendly hotel situated in the gorgeous resort of Cancun, offering all the comforts and amenities necessary for a relaxing holiday. The hotel's spacious guestrooms offer fantastic views of the sea and are equipped with luxurious furnishings and modern conveniences suitable for all guests. The large pool is equipped with sunbeds and includes a lovely pool bar, making it ideal for a laid-back afternoon in the sun. 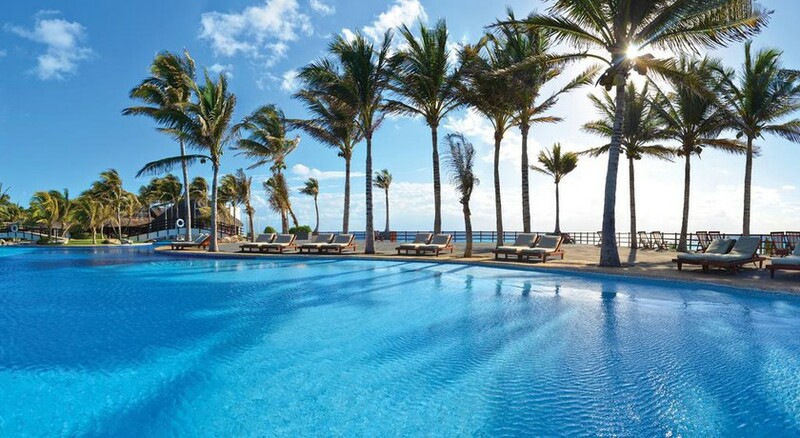 The resort also features a state-of-the-art gym, luxurious spa, pretty gardens, a golf course, special services for children, daytime activities and evening entertainment shows. Grand Oasis Cancun also features 18 restaurants and a wealth of bars, with delicious local and International fare, live music and a great atmosphere, plus there is a myriad of things to see and do in the nearby Hotel Zone. At the heart of Kukulcan Boulevard, Grand Oasis Cancun sits majestically in front of the Caribbean Sea and Nichupte lagoon. It's close to a private beach in Cancun too, at just a 4-minutes walk. 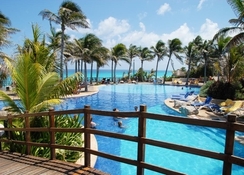 The hotel is 15km from Central Cancun and 20km from the Cancun Airport. Shops, discos and markets are all a short drive away. 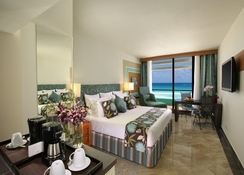 Grand Oasis Cancun has spacious, well-furnished rooms with spectacular views and contemporary amenities. The accommodation options are categorised as Grand Ocean Rooms – offering private balconies with sea views and Grand Rooms – offering private balconies with garden views. 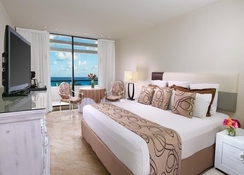 These elegant rooms with modern decor are fitted with a double bed or king size bed, minibar with daily replenishment, LCD TV, fully-equipped bathroom and private balcony with excellent views of the Caribbean Sea or lush gardens. The Grand Oasis Cancun has as many as 18 restaurants offering an incredible range of choice to the guests to indulge their palate. There are Mexican and Mediterranean restaurants, International buffet, snack bar, gourmet restaurants, traditional cuisine and even a sushi bar. 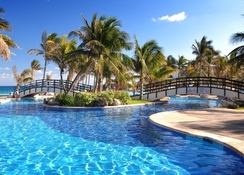 The drinking venues include beach and pool bars, lobby bar, cigar bar and a health bar, where you get everything from inventive cocktails to local wines. There are non-alcoholic bars as well. 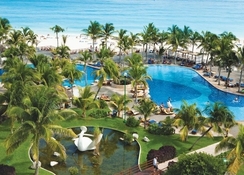 At Grand Oasis Cancun, there's a medley of amenities for recreation and leisure. The hotel houses a luxury spa that offers amazing therapies and treatments for total rejuvenation of guests. There’s also a separate spa for kids and teenagers with jacuzzi and treatments such as chocolate therapy and fish spa. The large swimming pool equipped with sunshades and sunbeds is a great place for a relaxing dip, where guests are serviced by a lovely pool bar. There are boardrooms for celebration of events, loads of daytime activities, entertainment programs in the evening and special services for kids.